Features include flat lock sticthing to minimise rubbing, a velcro strap to ensure a snug fit around the ankle and strong rubber sole for excellent grip. Size: Available in UK kids sizes 9 through to 2. 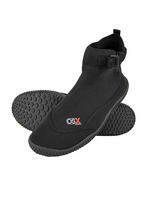 Wetsuit boots are must have accessory in your beach bag. Great for protecting feet while wading in the sea, rivers or rock pools. The OSX wetboot is ideal for Kayaking, surfing, snorkelling, SCUBA diving, wind sufing, sailing, kite boarding the list goes on. OSX wetboots easily compete with some of the big names for durability and build, at a fraction of the cost. Available in standard childrens shoe sizes.